When in Taipei, you must try Taiwanese breakfast at least once. 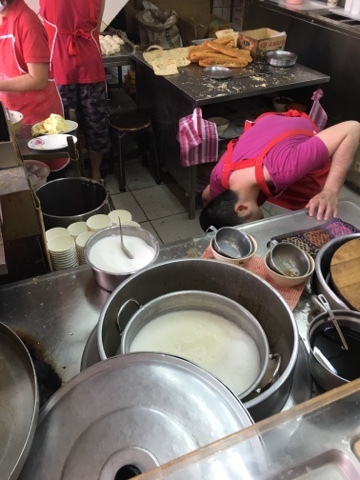 There are breakfast shops like this all over Taipei- look for the signs with the characters above or a basket of long fried crullers out front. 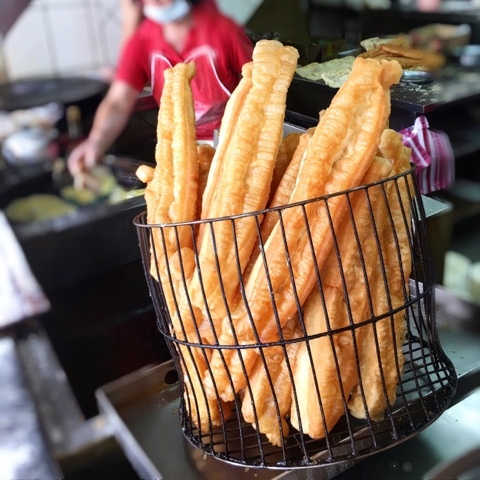 I am the type of person that will get excited about a photo of a basket of you tiao.. If you are too, then you are in the right place. I am still unsure if all the Yong He Dou Jiang's originated from the same source at one point, or did they all spring up individually? This Yong He Dou Jiang Da Wang layout is quite similar to the other one with the same name, with the work space to make the you tiaos in the front. 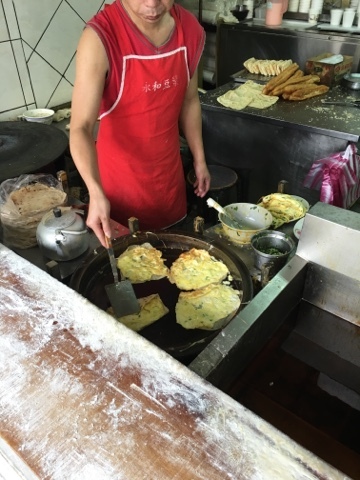 If you want to eat where the locals eat, then start with your neighborhood Yong He Dou Jiang... My personal picks are a cup of cold soy milk with shao bing you tiao (pictured up top as first photo) 燒餅油條 or sesame flatbread with fried Taiwanese crullers. Or as my friend Chris said when he tried it for the first time, a carb sandwich!!! 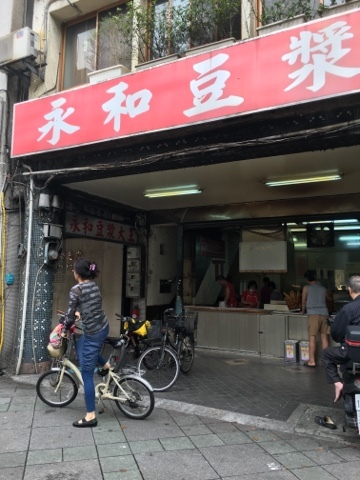 I wouldn't say this is my favorite Yong He Dou Jiang Da Wang, but it's a good place in Daan District to grab and go when you don't want to wait in line. (My favorites are all getting too damn crowded) It's right off the RenAi circle and near Jiu Ru, which has really delicious won ton soups and tang yuan, though I haven't been in years. This shop preps a lot of the food in advance, so my you tiao wasn't crispy although the shao bing was good. The you tiao wasn't crispy inside the fan tuan either, which was a bummer. The best fan tuans for me are from the street carts... they always manage to have crispy you tiao inside. NT$87 for cold soy milk, shao bing you tiao and fan tuan. Can't beat that. Hello :D Does this branch have seats? Or do you have to eat standing up?